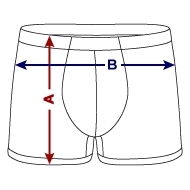 Men's Boxer Briefs is in stock. We will print it as soon as you order it. When great men wear great underpants, the sky is the limit for what they can achieve. Generations of aspiring gentlemen have been wearing these classic briefs ever since the 1950s whilst enjoying timeless comfort and style.